The 4F3/2 4I9/2 quasi-three-level transition of laser crystal produces 915-nm continuous-wave laser. Through the graphene saturable absorber, the laser changes to giant pulses, which manifests that the graphene has great potential for the modulation of short wavelength laser. The research group, led by Prof. Zhengping Wang, from State Key Laboratory of Crystal Materials, Shandong University, realized Q-switched output of 0.9-um laser with graphene as the saturable absorber. The graphene was prepared on K9 glass substrate with liquid phase exfoliation method. To elevate pulse energy and shorten pulse width, a mixed crystal, Nd:La0.11Y0.89VO4, was utilized as the laser medium whose emission cross section is smaller than that of Nd:YVO4 crystal. At an absorbed pump power of 7.62 W, the maximum average output power was 0.62 W, and the highest pulse energy, minimum pulse width were 2.58 uJ, 84 ns, respectively. The wavelength was 915 nm, corresponding to the 4F3/2 4I9/2 quasi-three-level transition of Nd:La0.11Y0.89VO4 crystal. Such laser has important applications in water vapor detection, ozone detection, and differential absorption radar. Its second harmonic generation can supply blue coherent light, which can be employed for biomedicine, underwater optical communication, high density optical storage, and laser color display. It is reported in Chinese Optics Letters Vol. 12, No.1, 2014 . As a novel developed photoelectric material, the zero band-gap structure of graphene leads its saturable absorption (SA) characteristic that is wavelength insensitive, so full wave band saturable absorber can be fabricated. While the current popular SA materials such as Cr4+:YAG crystal or GaAs semiconductor just respond to certain wave bands, which have no universality. WhatÃ¢â‚¬â„¢s more, compared with Cr4+:YAG or GaAs, graphene owns shorter fabrication period and lower production cost, which are favorable for large scale promotion. 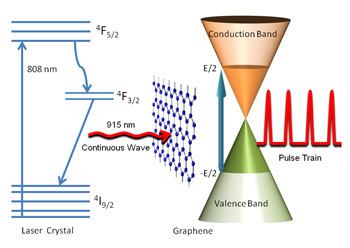 Here it is the first time to the best of our knowledge that graphene is used to the pulse modulation for the laser with wavelength shorter than 1 um, which fully demonstrates the advantages of preparation convenience, wavelength non-selectivity, short recovery time, and small loss. The present research manifests graphene possesses great potential and broad prospects for short wavelength laser modulation. Next, the overall laser performance is planned to be improved by further optimizing the graphene, the laser medium, and the resonator parameters. Combing with nonlinear frequency doubling technique, new type solid-state blue laser source will be developed. At the same time, the graphene saturable absorber will be applied to more wave bands.